Puppa had the most liked content! Nothing happens to mine. Just over revs and hit the next gear up and all good If you hold the left paddle down it will shift a few gears not just the one so it can happen. I don't think you have to be too concerned about it if its a rare occurrence. Don't worry about it. Done it a few times when holding the paddle to downshift and going one too many gears. Congrats mate. Big fan of these in silver. Plenty of fun to be had in these cars. Enjoy it. 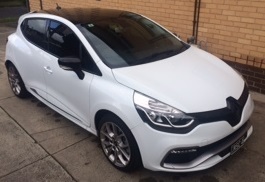 I have had my clio IV for nearly 6 months now and I actually love driving it every single day. Living with it on a day to day basis is great. The car is super comfortable, but when you really want to get some performance out of it there is more than enough to satifsy. 4 doors is big bonus and there is plenty of room in the back for passengers. I am over 6ft tall and have had 3 mates in the back with ease. Living with the gearbox everyday is fine too, in 'normal' auto mode it could be little quicker but nothing that the touch of the 'sport' button doesnt fix. I love the look of both cars and if had no restraints (the Mrs not being able to drive manual, budget etc) then I probably would of chosen a Meg. But if you were to choose the Clio I can assure you will not be sorry. Either car will bring a smile to your face. Congrats Phil. The grey is very nice with the black wheels. You might be the first owner of that colour on here. Congrats mate. They look fantastic in black. There is already a wealth of information on them on here so be sure to have a good look around. Congrats mate. I'm around the same area so I'm sure I will see a fellow white RS pretty often.